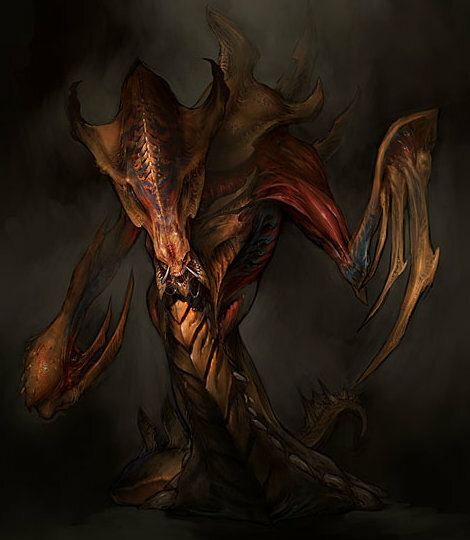 These Zerg, easily the size of a horse, spit hyper-velocity needles (which they produce as rapidly as they fire, via an internal organ) as powerful as a heavy rifle. They can't fire them anywhere near the rate of a Terran machine gun, but they tend to travel in numbers which make up for this. Traits: Zerg; Enhanced Move 1 (Ground); No Fine Manipulators; No Legs (Slithers). • “Muscular Augments” – Enhanced Move 2 (Ground: 32). • “Grooved Spines” – Needle damage becomes 15d(3) imp.